I witnessed something authentically beautiful in Guatemala with Justin Bieber. I have helped build the nonprofit Pencils of Promise (PoP) from the ground up. PoP works with communities across the globe to build schools and create programs that provide education opportunities for children. The founder, Adam Braun, and I connected a few years ago when there was only one school built; four years later we've broken ground on more than 160 schools in four countries--many of which Justin has provided funding for. This was a day we've been talking about for a few years: the day Justin would visit the schools, help build them and interact with the children whose lives' he has helped. We arrived in Guatemala City on Saturday afternoon, and realized how much of a covert operation this had to be in a country where kidnapping of high profile people is widespread. After Justin performed we went straight to the hotel. The first thing out of his mouth to Adam was, "How can I help people in the best way possible?" The Brauns led with their mission of changing the world and their dedication to bettering the lives of children in developing countries. Due to security risks, the next morning we flew across the country to the jungle where there are two PoP schools: one that was completed and one that was being built. This is where the beautiful day began. In the remote area in Guatemala, no one recognized the biggest pop star on the planet. I couldn't imagine what it would be like to have to be so guarded to the world everywhere you go because everyone wants something from you. Being on the inside, and witnessing the unguarded, big hearted kid that Justin is has been such a powerful experience. The moment we landed, Justin began interacting with the kids and having the time of his life. There was no hesitancy in being in a part of the world with such poverty that he has never seen. He jumped in with open arms from the time we landed until the time we left. 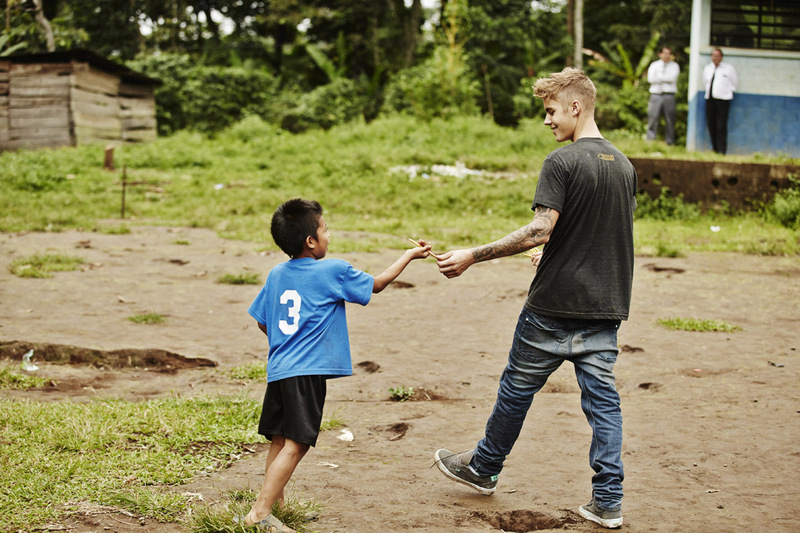 Justin played with the kids, performed manual labor to build the school in process, and gave out pencils. Local people had no idea who he was, which allowed him to operate in an unguarded state of being. I saw the side of Justin that is the authentic Justin--the side the public doesn't get to see-- the open hearted person who cares and has a love for people. Upon entering the village, he immediately fell in love with this little 4-year-old girl and carried her around the whole day. She completely won his heart that day. We played games with the kids, and experienced a joy in people who have next to nothing. As we were heading out, Justin took the shoes off his feet and gave them to a kid that didn't have any shoes for himself--quite an honorable gesture. On the ride back, we reflected on the experience. We were all moved by developing a deeper compassion with those in need, and being reminded that we live blessed lives. Upon returning to the hotel, I had a chance to edit the photos, and Justin looked through them 3-4 times with great nostalgia for the day. There was one point where he landed on a photo of him and the little girl, and he broke into tears. At that moment, I realized how my work of capturing those moments created such an impact on the biggest pop star in the world, and how they will help him remember one of the most powerful days of his life. Nick Onken is a New York City based photographer who specializes in Lifestyle, Celebrity, Lifestyle Fashion and Travel Photography. His new blog for creative entrepreneurs, nickonkenshoptalk.com, launches in January 2014.